Although abundant in household surveys, two defining properties of anthropometrics (survival thresholds and non-monotonicity) limit their application in studying social welfare and inequality. We examine the effect of working with welfare decreasing variables on properties of the Lorenz curve, the equally distributional equivalent value and the class of Atkinson-Kolm-Sen (AKS) inequality indices. This analysis leads us to introduce new variants of AKS indices that are appropriate for welfare decreasing variables. 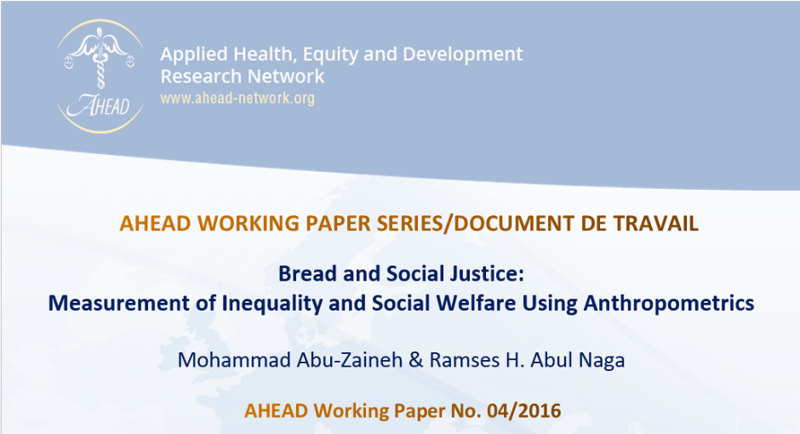 When applied to a group of five Arab countries (Egypt, Morocco, Jordan, Comoros and Yemen), the findings provide some support for the hypothesis that lack of bread and social justice may have contributed to the Yemeni revolt of 2011. In Egypt, on the other hand, it would appear to be low levels of social justice rather than lack of bread that may have contributed to the outbreak of the Arab uprising.